Eleven people for a sit down dinner. To some, that might seem like a lot, but for our family, who meets every Sunday at my parents’ house, it’s just “Sunday Dinner”. My mom can carry off this dinner like a pro. She usually goes crazy each and every Sunday with homemade brioche or focaccia, roasted meats, fresh from the garden lettuces and vegetables and always a drool-worthy dessert. This last Sunday was my turn to host. It was to be a graduation celebration for my daughter, Zoie, and my niece, Lindsey. In true celebratory fashion around here, they got to choose the dinner and dessert. They chose seafood crepes. Can you tell they are both avid foodies? They fit right in with my family of crazed foodie lunatics. 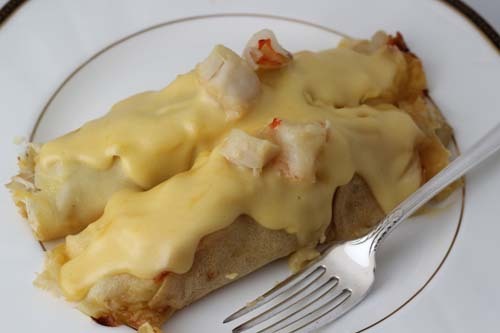 The thought of trying to replicate my mother’s famous seafood crepes was more than a bit daunting, but luckily she was just a phone call (or ten) away and thus I dug right in and, if I do say so myself, I totally pulled it off. They were rich and creamy, stuffed with garlic-y bites of scallops, shrimp and crab, and they were a perfect way to congratulate the graduates. The nice thing about a dish like this is that it can be made ahead of time and just popped in the oven 30 minutes before serving. So, although I was toiling for a couple of hours that morning (I would be a liar if I told you it was a snap to make) flipping crepes, making mornay sauce, shelling and cleaning shrimp, sauteing fish and finally filling the crepes, I was totally relaxed come dinner time. I could almost put my feet up and sip lemonade or something….well…almost. I served it with a summer salad filled with English peas, barely steamed crispy green beans, toasted pine nuts, arugula and a lemon vinaigrette. If you have a special occasion dinner coming up, these crepes might be just the thing. Make sure to plan about an hour and a half of prep time though either the morning of your event or the night before so you don’t cuss me out later. I would really prefer to avoid that. In a large mixing bowl, whisk together the flour and salt. In a large liquid measuring cup, measure the milk and crack your three eggs into the milk. Beat with a whisk. Add the Canola oil to the milk mixture and beat. SLOWLY, adding only about 1/4 c. of liquid at a time, pour your milk mixture into your flour, whisking thoroughly so there are no lumps. 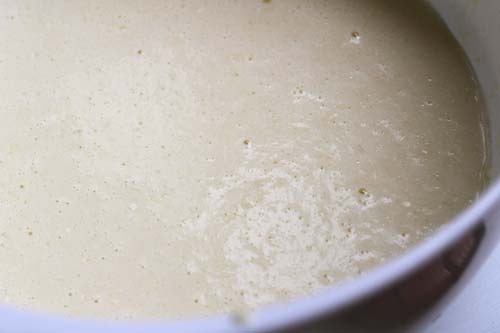 Continue adding 1/4 c. of the milk mixture until all of it is beaten into the batter. See how your batter should look? Now get your wax paper and cut 12 squares large enough to place in between each crepe as you make them. In a medium saute pan or a crepe pan, lightly oil your pan with Canola oil. I like to rub the oil all around with either a rubber spatula or paper towel and then soak up any excess with the paper towel. Place your batter bowl very close to the stove. Heat your pan on medium heat until hot and then using a 1/3 c. measuring cup, scoop out 1/3 c. of the batter and lift your pan off the burner and up to the batter bowl and pour in the crepe batter, swirl it around the pan with your wrist so the batter amply covers the bottom (only) of the pan. Place the pan back on the burner and cook for about a minute. Flip and cook for just 30 seconds. Let it cool while you make your next crepe and while the next crepe is cooking for a minute cover your last crepe with a sheet of the wax paper. To make the Mornay Sauce: Cut your butter into table spoons and drop into a large sauce pan or small stock pot over medium heat. Stir butter until melted. Whisk in your flour a little at a time until smooth, with no lumps. Add your salt and pepper. Heat the milk in a liquid measuring cup in the microwave for about a minute. This assures that the sauce will stay smooth and no bits of butter will clump up with cold milk being added. Pour the milk into the pot and whisk until smooth. Bring to a gentle boil. If you need to turn the heat up to medium-high that is fine, but watch it and stir frequently (so it doesn’t burn) with a wooden spoon, scraping the bottom of the pan now and then. 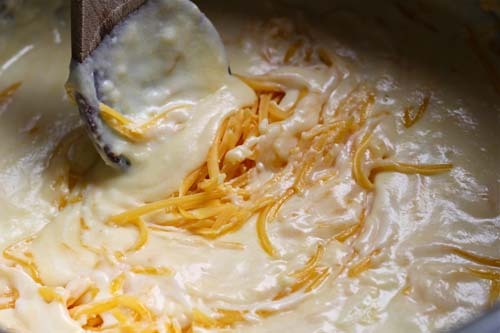 Add the grated cheese 1/2 cup at a time, stirring until smooth and creamy. Turn off the burner and let sit while you make the seafood filling. To prepare the scallops: Trim off the tough muscle (small side) of each scallop and rinse thoroughly then pat dry. The scallops absolutely must be totally dry to get a nice sear on them so dry them well. Salt and pepper your scallops. Heat a large skillet with about 1 T. of olive oil and 1 T. of butter on medium heat. Mince two cloves of garlic, and saute it in the pan. Turn pan up to medium high, moving the garlic to the outside edges of the pan so it doesn’t burn OR you can take just the garlic bits out and put them aside while you sear the scallops. You don’t want the garlic to burn because it tastes terribly bitter when burnt. Make sure your pan is good and hot now on about a medium-high heat. Add 1/2 of your scallops (enough to cover the bottom of your pan but do not crowd the pan and squish them in) and cook about 1 – 1 1/2 minute(s) on each side getting a nice golden sear. The middle of the scallop should remain translucent when you cut it in half. Cook all of your scallops. Keep your scallops cooling in a large bowl and add the garlic back in if you took it out. 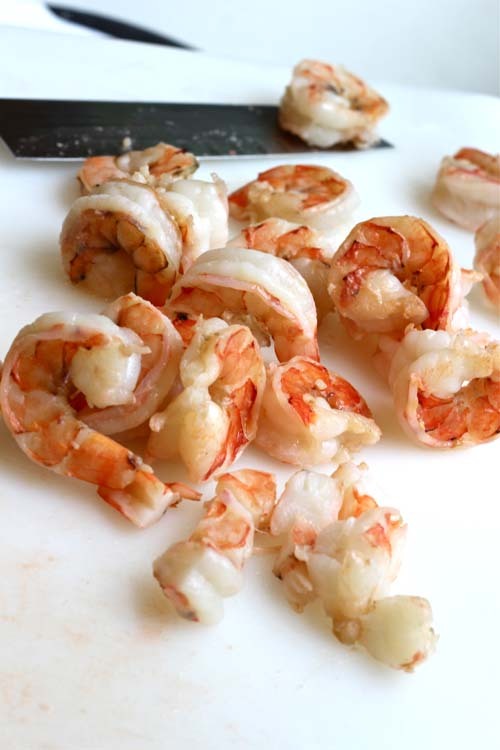 For the Shrimp: Remove the tail, peel and devein (make a slit down the back of your shrimp with a sharp small knife and remove black portion rinsing out crevice), rinse and then pat dry. In a large skillet on medium-high heat, put in a tablespoon of olive oil and two chopped cloves of garlic. Saute the garlic for a few seconds and then add half of your shrimp. Cook about 1-1.5 minutes on each side of the shrimp. Cook in two batches. 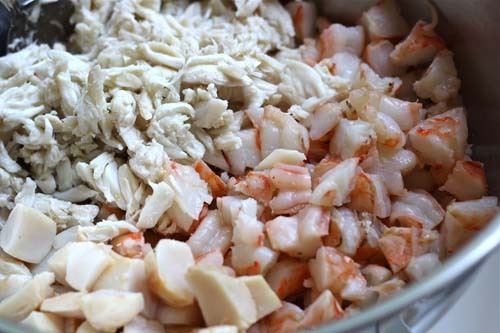 Once the scallops and shrimp are cool enough to touch, chop in large chunks (about 1/2 inch each, see photo in post). 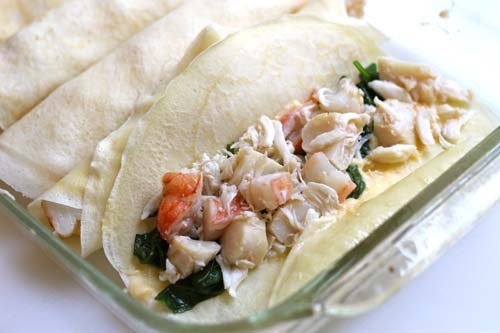 Mix the shrimp, scallops and canned crab together in a large bowl to comprise the crepe filling. Squeeze a couple tablespoons of lemon juice over the mixture and stir. Optional addition: Sauteed spinach! I just sauteed one bag of baby spinach in a trace of olive oil with some garlic to add to some of the crepes. It cuts down on the richness a bit and added a healthful bonus. 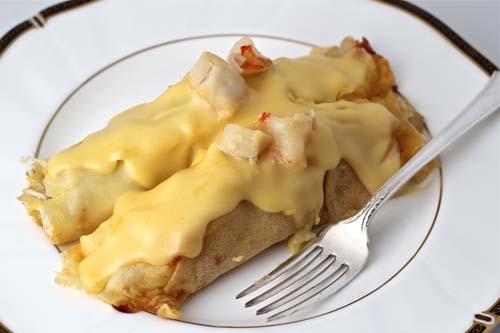 When filling the crepes, spread about two large tablespoons of mornay sauce onto the crepe in the center and spread it vertically in a straight line. If the sauce is too thick, simply heat it up over a low burner and stir until it is smooth again so you can work with it easily. Layer on the spinach vertically (if you are using spinach) over the sauce and scoop the seafood over the sauce as well. Roll it up like a….well…just roll it up. You don’t need to fold in the ends. Place in a rectangular glass casserole dish that has been coated with nonstick cooking spray. *These can be baked up to one day later but not more since you are dealing with shellfish and shellfish has a very short shelf-life. Google food safety and shellfish if you have any specific questions. Ladle two more tablespoons of the sauce over each crepe once you have the casserole dish filled. Bake at 350 degrees F. for about 30-40 minutes or until sauce looks hot and melted. Serve hot. Enjoy! Categories: Fish, Salads | Tags: graduation dinner, mornay sauce, savory crepes, seafood crepes | Permalink. They look delicious. A wonderful celebration dish. You have made it look easy but it wouldn’t have been my first choice when feeding a large group. Good to know it’s something that can be made ahead of time though. I hate running around at the last minute before guests arrive! What an enchanting dinner! The Seafood Crepes are amazing! Congratulations to your daughter and niece Geni! This meal is absolutely divine! Great choice by the grads who will clearly do well in life with the ability to not only make decisions, but good ones. I never would have thought of these for a meal choice which is odd because I do love them at restaurants. Will definitely be making this one! Your crepes look so evenly thin and beautifully done, Geni. The seafood filling is the winner. Beautiful! I love savory crepes!!! Oooh, me too. Thank you so much! What a delicious celebratory meal you made. A big “thank you” for you and your mom for the recipe…it sounds great. You are most welcome and thank youf or your sweet comment. you best believe I am making this for my seafood loving husband. IT looks absolutely amazing and the best dish I have ever seen from you! WOW! Thanks for the fantastic compliment! You make my tummy grumble early this morning, I would really love this. I love the idea of Sunday dinners. It’s such a a wonderful tradition. These crepes look delicious! Wow this looks soooo delicious! What an original idea 😮 It’s got to be fantastic! It is pretty yummy! Thank you so much for the nice compliment! My friend, I’ve so missed your blog. This recipe looks absolutely magical.